What's Up With Virginia's Budget? "The General Assembly's money committees are bracing for a possible state revenue shortfall that could exceed $1 billion over the next two years and force deep spending cuts in a biennial budget that has yet to be adopted. "House Appropriations Committee Chairman S. Chris Jones, R-Suffolk, informed local government officials Wednesday that a potential shortfall of $300 million to $350 million in the fiscal year that ends June 30 would have major consequences for state and local government in the next two fiscal years. "While we will not know the final revenue numbers until the end of June, it appears very likely that the commonwealth could face a significant revenue shortfall for the current and next fiscal years," Jones said a letter that he also sent to Gov. Terry McAuliffe and members of the Assembly. "That shortfall could exceed $1 billion for the biennium." "Sen. John Watkins, R-Powhatan, a member of the Senate Finance Committee, estimated a potential two-year shortfall ranging from $1.1 billion to $1.4 billion. "I'm guessing it's worse rather than better," Watkins said Wednesday." "As May gives way to June, the pressure is on for Virginia lawmakers to enact a state budget, the absence of which has created a lot of uncertainty for local boards and departments that rely on state funding. "Add to that an expected revenue shortfall of about $300 million this current fiscal year, and the situation gets all the more urgent." "1. There never was a surplus. Former Gov. Bob McDonnell often touted his “budget surplus” accomplishments, but in reality, there is no such thing as a budget “surplus.” In the short run, yes, the state can generate and collect more revenue than it spends. In the long run, however, the commonwealth’s debt is more than $65 billion. That’s more than $8,000 for every man, woman and child in Virginia. As long as Virginia has debt, it will, in a sense, always be trapped in a shortfall. "2. The budget has been mushrooming. Over the last decade, both Republican and Democratic leaders have allowed the state’s operating budget to mushroom by 62 percent, or 20 percent when inflation and population growth are taken into account. From 2004 to 2013, the state’s annual budget grew by $16.3 billion, according to a report by the Joint Legislative Audit and Review Commission. McDonnell, dubbed a fiscal conservative by many, proposed the largest biennial budget in Virginia’s history at $96 billion — $10 billion more than the current biennial budget. "3. Corporate handouts bloat the budget. McAuliffe wants to boost corporate welfare handouts to $136 million over the next two years, a 24 percent increase. Plus, he wants to subsidize technology companies with another $22 million. And this year, state lawmakers voted to boost tax breaks to film companies by even more millions. They’re the kind of handouts Matt Mitchell, a senior research fellow with George Mason University’s Mercatus Center, calls “unsustainable.” Yet Virginia continues to spend millions upon millions on corporate welfare. "4. Virginians want to fix revenue gaps with spending cuts. When a similar budget situation arose in 2008, Virginians said they would rather fix a revenue shortfall with spending cuts than anything else. In a poll by Christopher Newport University’s Center for Public Policy, 56 percent of respondents said they would choose to fund a revenue shortfall by cutting spending rather than increasing taxes or dipping into the state’s rainy day fund. About one-third of respondents supported cutting spending and dipping into the rainy day fund, and just 10 percent supported raising taxes to fix the gap. The poll was conducted from Jan. 8-10, 2008, with 700 registered voters and an error rate of plus or minus 3.7 percentage points." Stay tune to see how Virginia's budget is settled. Investor's Business Daily (IBD) posted an editorial this evening in which they ask whether "Wal-Mart really need(s) tax subsidies to succeed? Does Apple? What about Hollywood?" They answer the questions, saying, "A new study shows that while these goodies enrich companies, they make residents poorer." "Earlier this year, Virginia Gov. Terry McAuliffe signed a bill that more than doubled the tax credits available to film producers who come to the state. McAuliffe called it a big win for Virginia, since so many other states compete for Hollywood productions with special tax favors. "Meanwhile, Wal-Mart has secured a total of $1.2 billion in at least 260 special benefits over the years. Nike, Boeing, Alcoa and Intel got more than $2 billion each. "North Carolina promised Apple up to $370 million in benefits and an additional $255 million to Google to build data centers in the state. "As in Virginia, every time such a deal is struck, politicians — Democrats and Republicans — stand at the podium and brag about all the jobs and all the economic activity these special breaks will create. "But there's nothing to back up such claims. That's made clear in a new report from George Mason University's Mercatus Center, which finds that these targeted benefits leave residents worse off." The study, "The Polical Economy of State-Provided Targeted Benefits" (Number 14-13, May 2014) was published earlier this month by George Mason University's Mercatus Center, located on Fairfax Drive here in Arlington, VA. The study's authors are Christopher Coyne, economics professor and associate director of the F.A. Hayek Program, and Lotta Moberg, GMU Ph.D. candidate in economics. "First, such deals will almost inevitably misallocate a state's limited resources, making everyone poorer as a result. "North Carolina, for example, spent $77,000 per job at a new FedEx delivery hub. South Carolina spent $68,000 per job on incentives to BMW. Michigan's tax credit program cost taxpayers $45,000 per job, Minnesota's ranged up to $30,000 per job. "Targeted benefits can also crowd out competitors. Much of the state tax money showered on Wal-Mart, for example, ends up paid by retailers that compete with Wal-Mart. "Companies can win fat breaks just by threatening to leave. So, many of the jobs "created" by the breaks likely come at the expense of jobs or opportunities elsewhere. "Then there's the problem of rent seeking, as companies focus more and more on competing for political favors rather than for customers. "Once in place," the paper warns, "cronyism is hard to root out." Which is why taxpayers would be well advised to hold their applause when a politician brags about some a new targeted tax." Coyne and Moberg also point out these targeted benefits have a bias towards larger firms. They explain it this way: "When targeted companies hire people and invest, they can create the illusion that the benefits they receive increase a state’s well-being. Policymakers therefore have an incentive to make large-scale, observable investments that appear to contribute more to a state’s economic development. This creates a bias toward large firms when granting targeted benefits." Governor Terry McAuliffe -- write him, or call (804) 786-2211. Senators Adam Ebbin, Barbara Favola, and Janet Howell -- contact information here. Delegates Robert Brink, Patrick Hope, and Alforso Lopez -- contact information here. Arlington County's 'Cash on Hand' Still Too High? "The Arlington County government coffers continue to be flush with cash, with the amount on hand setting a year-over-year record every month since the start of the government’s fiscal year last July. "In April, the various government portfolio accounts held about $360 million, according to figures from the county treasurer’s office. That’s about 20 percent more than a year ago, and more than double the cash and investments on hand five years ago. "April generally represents the point in the fiscal year at which financial reserves are at their lowest, since it has been six months since the last installment of real estate taxes was due. The amount on hand usually grows from April to June, as additional taxes come due, then decline over the summer months before rising once again in the fall. "For the current fiscal year, the amount of cash and investments on hand peaked at about $620 million, an all-time high, in October." We growled about this issue a year ago when on July 24, 2013, we growled, citing a similar news report by Mr. McCaffrey, that a large growth in per capita cash on hand doesn't necessarily mean that "the county's cash on hand is too much, too little, or about right." Nor did we find "any mention of a policy regarding appropriate cash or fund balances. Such a policy would define the financial resources that should be set aside for contingencies, how much should be allocated to the rainy day, or budget stabilization, fund when such unreserved fund balances should be used, and the appropriate size of such a fund." We also note an exchange of opinion columns at the news portal, ARLnow.com, between Peter Rousselot, a former chair of the Arlington County Democratic Committee and former chair of the County Board-appointed Fiscal Affairs Advisory Commission, and Mark Schwartz, Deputy County Manager. (Mr. Rousselot's here; and Mr. Schwartz's here or here at the county website; and a follow-up column by Mr. Rousselot here). The county also has a detailed, 5-page schedule of FY 2012 year-end "cash reserves and investment detail." Below is the chart, which McCaffrey includes with his report. And if you're wondering, yes, it looks much like the one we included in our July 2013 Growls. In last year's Growls, we said that what was needed was a written statement of a fund or cash balance policy, as defined by the Government Finance Officers Association. Unless there is a clear and written policy, there will continue to be continued haggling by both sides arguing the other side is making "apples-to-oranges comparisons." What are the surpluses earmarked for, if anything? Trolley, aquatics center, school construction, anything at all? If the money is in the accounts, presumably the County can tell us about the intended purposes. Will the County Manager reveal the process by which they estimate revenue projections since they continuously underestimate actual revenue collections? I have written about this on multiple occasions, and this year the Board used the revenue surplus as its rationale for the token tax rate cut. Why didn’t the growing surpluses warrant a larger tax rate cut? Many fiscal watchdogs have called for a rebate to taxpayers, not just Treasurer O’Leary. Will you publish the county’s “check register” online? Arlingtonians should be able to track revenues, expenditures, and accounts on a regular basis without relying on annual reports from the Treasurer. This can be done in a manner that would both provide maximum transparency while protecting privacy. 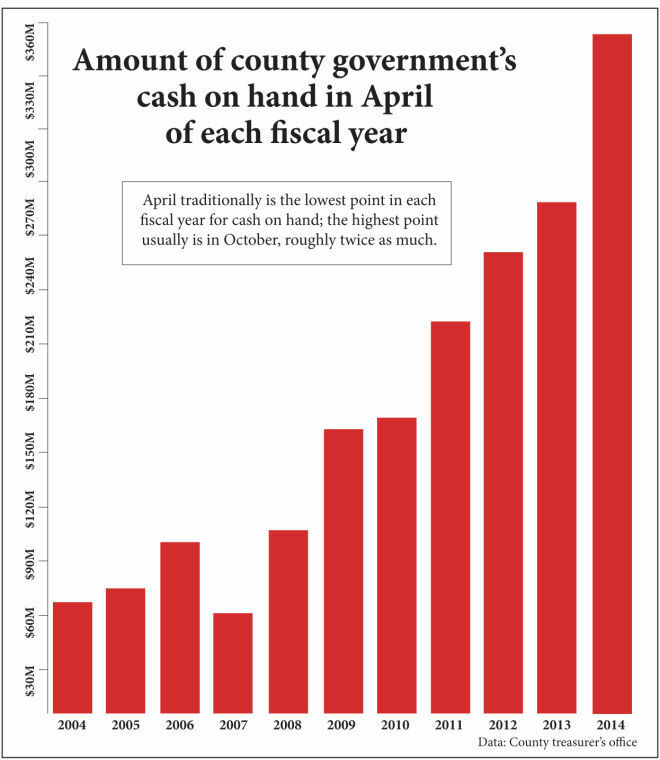 This latest reporting of the county's cash on hand reinforces our belief the county needs a clearly defined policy regarding cash reserves and fund balances. Jillian Kay Melchior, a fellow at the Franklin Center for Government and Public Integrity and at the Independent Women's Forum reported at National Review Online last week that "(g)overnment workers at the Defense Advanced Research Projects Agency will enjoy membership at a full-service gym within a mile of their Arlington, Va., office — kindly subsidized by the taxpayer. Earlier this week, the agency announced contracts with two gyms, contracts that have a total value of up to $1.02 million." "Each contract can accommodate up to 150 DARPA workers, including both civilians and members of the military. Employees will contribute a portion of that $1.02 million total potential contract value. "At Gold’s Gym in Arlington, DARPA employees will be responsible for $20 of the monthly fee, with the federal government covering $31, an employee says. At Sport & Health Clubs in Arlington, another gym employee tells me by phone that the federal government “pretty much pays for the entire membership right off the bat” for DARPA workers." "Both gyms offer several cardio machines, a full weight-training program, group exercise classes, a sauna, and other amenities. We last growled about federal employee pay on August 17, 2013, based upon a National Review Online op-ed by Andrew Biggs, a scholar at the American Enterprise Institute. According to Biggs, federal employees "receive salaries and benefits around 37 percent higher than do private-sector workers with similar levels of education and experience." Moreover, Biggs said their research was corroborated by a Congressional Budget Office study. The next time President Obama complains about income inequality, we need to remind him that it's "golden benefits" like those described by Jillian Kay Melchio for DAPRA employees that is increasing income inequality. Sheesh! In today's online Arlington Sun Gazette, Scoff McCaffrey reports, "Per-student spending tiptoes closer to record in Arlington school budget." More specifically, McCaffrey writes, "The per-student cost will rise to a near-record $19,244 under the $539.4 million fiscal 2015 budget approved May 22 by the Arlington School Board." We last growled about Arlington per-student spending on December 29, 2014, reporting the Arlington per-student spending was the most expensive among schools who are members of the Washington Area Boards of Education (WABE). We've since learned that Arlington's public schools have a long ways to go before being the area's most expensive, however. According to an op-ed by Terry Jeffrey, posted May 14, 2014 at Creators Syndication, the Washington, D.C. public schools spent $29,349 in the 2010-2011 school year, based on the latest data from the National Center for Education Statistics. "The spending plan is nearly identical in size, if not in all the details, as the one proposed in February by Superintendent Patrick Murphy. It represents a 3.1-percent increase over the fiscal 2014 adopted budget, and would fund more than 4,100 full-time-equivalent positions. "Some of the extra funds will be used to support rising enrollment, but the per-student spending (factoring in the student-body increase) would still rise 2.9 percent. The per-student cost is approaching the record of $19,539 set in fiscal 2009, when the school system was still flush with cash in pre-recessionary times. "In what probably came as a surprise to no one, School Board members on May 22 agreed to rescind, for at least a year, proposed staff cuts for aides to students with autism. The cutback, which would have saved about $271,000 in the coming year, was vocally opposed by some parents of those students. "School employees will receive a 2-percent raise and a $500 one-time bonus." Readers of this Growls must be wondering just how that extra roughly $10,000 is being spent in the Washington, D.C. public schools. It apparently isn't being spent on educating students since Jeffrey also reports that "in 2013 fully 83 percent of the eighth graders in these schools were not "proficient" in reading and 81 percent were not "proficient" in math." The FY 2015 fiscal year WABE report won't be available until the fall. Stay tuned! An archive of WABE reports is available here. The Export-Import Bank. Crony Capitalism Defined? In his latest Washington Examiner column published Saturday, Timothy Carney writes, "The Obama administration and the business lobby defend the Export-Import Bank of the United States by claiming it “makes a profit” for taxpayers. But this “profit” is an accounting fiction, a top federal budget agency recently found." 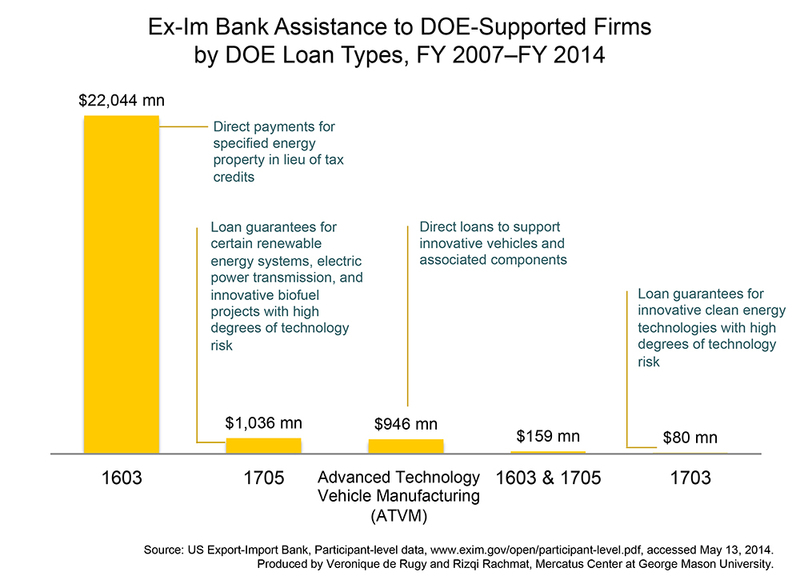 "Ex-Im is a federal agency that subsidizes U.S. exports through direct loans and loan guarantees to foreign countries. Ex-Im’s charter expires this fall, and conservative Republicans want to let the agency die. In its defense, officials at Ex-Im and the White House — joined by lobbyists for manufacturers and banks — typically assert that Ex-Im is free. “The Ex-Im Bank doesn't cost the American taxpayer a dime,” the U.S. Chamber of Commerce posted on Twitter on May 20. Ex-Im “pays for itself and makes a profit,” Ex-Im President Fred Hochberg likes to say. "The Congressional Budget Office reported May 22 that if Ex-Im used proper accounting methods, it would be budgeted as a $2 billion cost to the taxpayers per decade." "The debate delves a bit into arcane accounting matters, but it’s a crucial question as the Obama administration and K Street try to persuade Congress to reauthorize Ex-Im. "Before 1990, the federal government completely obscured the costs of loan-guarantee programs, such as student-loan subsidies and Ex-Im guarantees. Under the pre-1990 rules, when Wells Fargo loaned money to Air China to buy some Boeing jets, and Ex-Im guaranteed the loan, that guarantee would be budgeted as costing zero dollars -- unless and until Air China defaulted and Ex-Im had to pay Wells Fargo. "The Federal Credit Reform Act fixed that -- kind of. The 1990 FCRA said that agencies like Ex-Im had to account for expected losses, such as foreign defaults that it would have to cover. The CBO and many other accounting experts point out that the FCRA's rules omit a crucial part of the cost of a loan guarantee: something economists call 'market risk.'" Carney discusses several other intricacies, and concludes by saying, "It's always hard to justify an agency that exists primarily to subsidize large corporations. When you use honest accounting, it's impossible." Meanwhile, at the Mercatus Center, senior research fellow Veronique de Rugy has also focused on the Ex-Im Bank in three separate columns: 1) identifying the bank's biggest beneficiaries in her April 29, 2014 column; analyzing the types of projects assisted, May 12, 2014 column; and notes the "bank's 'green portfolio' benefits familiar names, May 19, 2014. If you prefer a video, Heritage Action for America explains the need to cronyism in a one-minute video. Meanwhile, staff of the Washington Free Beacon on May 2, 2014, cite a Washington Examiner report and a Mercatus Center study, and report, "The third biggest donor to Democratic candidates so far this election is cashing in from the Export-Import Bank. Finally, help end the "beltway bank" by signing this petition sponsored by Americans for Prosperity. 308,000 Virginians Registered in Other States. Problem? Kenric Ward of Watchdog.org's Virginia Bureau reports (HT Townhall.com), "Some 308,000 Virginia voters are also registered elsewhere, according to an analysis of 22 states’ election records," adding, "The finding follows Watchdog.org’s report of 44,000 people who appear to be registered in both Virginia and Maryland." "The latest survey found the 308,000 double registrations by matching names, birth dates and the last four digits of Social Security numbers. "The Virginia Voters Alliance, which reported the results, identified “big gaps” in the voter-registration process. "How many of the 308,000 voters cast multiple ballots in a single election is not known. "But George’s group — working with Election Integrity Maryland — says it found 164 individuals who voted in both states in 2012. "Virginia’s State Board of Elections acknowledged “voter registration problems” and “inactive voter registrations” were encountered in 2012. The left dismisses conservatives' calls for voter ID by demanding that we identify specific examples of voter fraud. Well, if there are 308,000 duplicate voter registrations, there certainly must be at least a few cases of voter fraud. Besides, why make it easier? Watchdog.org also provides state-specific reporting. Golden Hammer: The most egregious examples of government waste, fraud or abuse from TWT staff. Federal employees earned a Golden Hammer award, according to the Washington Times yesterday. The paper's Phillip Swarts reported that "audits expose federal workers' abuses of annual charity drive" with "money diverted to massages, excessive travel." "One of the most celebrated civic activities federal workers stage each year is the annual drive to donate parts of their paychecks to their favorite charities. But it turns out the much-celebrated Combined Federal Campaign has been plagued by misspending, lax oversight and abuse, with federal workers diverting money for massages, personal travel and other unauthorized expenses, according to internal audits. "In some cases, the federal workers who run their charity drives in their local communities have failed to impose even the most basic safeguards against fraud to protect the tens of millions of dollars they raise each year, the audits show. "The list of misconduct and waste is diverse, and spread out throughout the country and even internationally." "The most egregious example of waste occurred between 2007 and 2009 — and was reported by the IG two years ago. “Loaned executives” — agency workers selected to assist the fundraising campaigns — in the Washington, D.C. area spent more than $1,000 on a Christmas party and $400 for chair massages. "Plus, the executives ran up a nearly $4,000 tab for lodging and meal expenses they claimed were related to CFC conferences. "In actuality, they were arriving at the conferences early or extending their stays past when the conference ended — and charging the vacation to the charity program. "And to top it all off, between 2007 and 2009, a group of local D.C. workers on a CFC committee bought themselves breakfast and lunch to the tune of $18,000. "OPM officials told The Washington Times they have worked to correct the mistakes and are set to implement a number of changes that will prevent fraud in future campaigns. Donors and charities will have easier access to see how much money is going to pay overhead compared to what is being received by the charities. And officials said they have improved the way the money is collected and processed, which they hope will save $10 million a year on expenses. What a story of sordidness. "The United States has always prided itself on being a place that fosters new ideas and business endeavors, and for good reason. That success, however, is now at risk as indicated by the current debate over corporate-tax inversions — U.S. companies heading overseas to take advantage of simpler tax codes and more competitive corporate-tax rates in other nations. "Let’s face it: The inversion debate is symptom of an underlying reality. Our high corporate-tax rates — the highest in the world — and our incredibly complex tax structure are eroding our economic leadership. "For more than two centuries, entrepreneurs and risk-takers have chosen the United States to begin new ventures. However, the current tax code is forcing American companies to move elsewhere, and new startups might be considered foolish to even contemplate the United States with its current tax structure. "In response to Pfizer and many other U.S. companies openly planning to leave the U.S. for tax reasons, yesterday Senator Levin introduced the Stop Corporate Inversions Act of 2014. Corporate inversions are where a U.S. company buys a smaller foreign company and takes its headquarters for tax purposes. For example, Pfizer is trying to merge with U.K.-based AstraZeneca and claim the U.K. as its new headquarters. The U.K.’s corporate tax rate as of next year will be 21 percent, compared to 39.1 percent in the U.S.
"Practitioners interviewed by Tax Analysts (subscription required) find the proposal is so broad, open-ended and left up to IRS interpretation that many foreign companies operating in the U.S. could suddenly become subject to U.S. tax on their worldwide earnings. That would cause a whole other category of companies to take flight. Further, the bill only addresses one of many ways companies can reduce their exposure to U.S. corporate tax. For instance, Merck just sold its consumer care business for $14.2 billion to German drug maker Bayer." McBride includes a chart of the corporate tax rates and revenue for the OECD countries for the years 2010, 2011, and 2012, arguing that "cutting the U.S. corporate tax rate by 10 points or more would probably pay for itself." Kudos to the Tax Foundation for their educational efforts on tax issues. A Thought on the VA Scandal Being a Portent of ObamaCare? "The White House says Americans can't draw any conclusions yet about just how screwed up is the Department of Veterans Affairs medical care system. "Well, yes, Americans can. And if they have any sense — always a debatable proposition — Americans will. "One conclusion we can draw is an old, familiar one: No matter what the issue or activity, bureaucracy's first and strongest instinct is to protect itself in the face of a perceived threat. "Another conclusion is probably just dawning on those Americans with the wit to see it, because so very few of us have had a brush with a medical system of which government is the sole proprietor: Putting a government bureaucracy in charge of one's health is a gamble likely to end badly. "And yet, if Obamacare stands, that is precisely the gamble each and every American eventually will take. "There is no better predictor of the course of a single-payer medical system in the United States than the VA system, because it is a single-payer system." Source: his May 20, 2014 column, posted at the Cleveland Plain Dealer website. A brief note: For readers who have not followed "the VA scandal," Washington Post blogger Katie Zezima provided background yesterday about the VA and the scandals. At the Washington Times, Jim McElhatton reports the Obama transition "eceived clear notice more than five years ago that VA medical facilities were reporting inaccurate waiting times and experiencing scheduling failures . . . ." Today, he further reports the transition team was old of three audits that detailed the manipulation of wait times, and things were "so badthat the inspector general said it stopped trying to police the issue until the VA could prove its information was accurate . . . ."
"Unless the state is effectively constrained, fiscal irresponsibility will destroy the long-run viability of the political and economic order. If we take the desire to spend at will as a government habit that exists across time and place, as Adam Smith so urgently warned his readers about, and combine that with both the electoral logic of democratic politics and the vote motive faced by citizens within a modern democracy, then the necessity of effective constraints on the fiscal behavior of government is as true for democracies as it is for kingdoms or even dictatorships. It doesn’t matter if citizens have the right to voice their opinion on fiscal irresponsibility. The bias in democratic decision making is to concentrate benefits in the short run on the well-informed and organized interest groups, and to disperse the costs in the long run on the unorganized and ill informed. In this way, good politics is not necessarily good economics. Or to think about it another way, fiscal irresponsibility may be extremely popular politically and fiscal responsibility may be extremely unpopular, but that doesn’t change the reality that fiscal irresponsibility is irresponsible." Source: his essay, "Why Does Government Overspend? Because It Has Too Much Power," July 26, 2013, posted at the Heritage Foundation's InsiderOnline. "Porker of the Month is a dubious honor given to lawmakers, government officials, and political candidates who have shown a blatant disregard for the interests of taxpayers." Citizens Against Government Waste (CAGW) announced today that they "named Gov. John Kitzhaber (D-Oregon) as its May Porker of the Month for the failure of the deeply flawed, severely dysfunctional Obamacare exchange, Cover Oregon. Gov. Kitzhaber, a vocal, early Obamacare cheerleader, claimed that the exchange would transform healthcare in Oregon, and would be “better than relying on the federal exchange.” After receiving more than $305 million in federal grants to perform feasibility studies as well as to build, test, and operate the exchange, the state’s plagued healthcare platform was scrapped on April 25, 2014." "Oregon, one of the first states to approve building its own exchange, joins a list of other disastrous state-run healthcare exchanges in Hawaii, Maryland, Massachusetts, Minnesota, Nevada and Vermont. These seven states have reportedly invested $1.27 billion on their exchanges since October 1, 2014, while only collectively signing up 308,285 enrollees. To date, Cover Oregon has spent at least $160 million on its failed website, and managed to enroll 34,000 in private Obamacare insurance plans through paper applications only. "While Gov. Kitzhaber is clearly responsible for the actions of state workers and contractors, particularly on a project which he had lauded from the beginning, a March 20, 2014 assessment report of Cover Oregon that was requested by the governor passed the buck to both the state’s construction of the program and Oracle. The $228,000 “independent” review, which was based on interviews with 67 stakeholders and more than 3,200 documents, claimed that inconsistent, confusing, and misinterpreted communication with oversight authorities, as well as an “unrealistically high sense of optimism” regarding the October 1, 2013 launch date attributed to the massive failure of Cover Oregon. And the number one optimist was … Gov. Kitzhaber. "On February 12, 2014, House Energy and Commerce Committee Chairman Fred Upton (R-Mich.), Communications and Technology Subcommittee Chairman Greg Walden (R-Oregon), and two other subcommittee chairmen sent a letter to the Government Accountability Office call(ing) for an investigation to determine how federal funds were spent and whether the federal government provided adequate oversight. The letter stated that “the catastrophic breakdown of Cover Oregon is unacceptable and taxpayers deserve accountability” and noted that officials were aware of problems with the system in as early as November 2011. In the fall of 2012, the acting director of the Oregon Health Authority, Carolyn Lawson, said “According to the feds, we’re easily nine months ahead of any other state. We have multiple states that are asking if they can participate with us.” Ms. Lawson, who was appointed by Gov. Kitzhaber, resigned earlier this year, along with several other individuals associated with the health authority. CAGW suggests that Gov. Kitzhaber (perhaps by using one of the many pens that Oregonians were forced to use when enrolling in Obamacare) sign his name on the dotted line at the top of the list of the blameworthy individuals." At the late economist Milton Friedman said (QuotationCollection.com), The real problem with government is not the deficit. The real problem with government is the amount of our money that it spends. Kudos to Citizens Against Government Waste for their continuing efforts to highlight government waste, fraud and abuse. At the Daily Caller, Breanna Deutsch reports, "New research supports what many Americans already believe – lawmakers are influenced more by special interest groups than their constituents." "Matt Grossmann, author of the new book, “Artists of the Possible: Governing Networks and American Policy Change Since 1945,” looks at the movers and shakers behind 790 significant domestic policy changes since the 1940s. "Grossman, an assistant professor of political science at Michigan State University, found that the public plays a surprisingly limited role in legislative outcomes. In fact, he did not find any domestic policy issue area where the public opinion was the leading force in policy results. "Instead, interest and advocacy groups played a more powerful role in all issue areas. "Since 1945, says Grossman, the AFL-CIO, the NAACP, the U.S. Conference of Mayors and the ACLU have had more influence over policy than any other interest groups." "In 1964, 64 percent of Americans believed that the government was run for the benefit of the public. But in 2008, only 29 percent of Americans believed that policymakers were working in their interest. "The majority of Americans in 2008, 69 percent, thought lawmakers passed legislation that benefited only a few big interests. "I combed through hundreds of history books covering American public policy since 1945, tracking the most significant domestic policy changes that made it into law and the actors that historians credit for those changes. Of the 509 most significant domestic policies passed by Congress, only one in five were conservative, in that they contracted the scope of government funding, regulation or responsibility. More than 60 percent were liberal: They clearly expanded government. The others offered a mix of liberal or conservative components or took no clear ideological direction. When significant policy change occurs in the executive branch, it is even less likely to be conservative; only 10 percent of the executive orders and agency rules that policy historians cited were conservative. "Even labeling as conservative policy government expansions in pursuit of conservative goals, such as traditional values or tougher sentencing, makes little difference in this conclusion; few significant policy changes fall into this category, though we hear about them often in campaigns. "Not surprisingly, liberals play a greater role in bringing about new policy. Historians credited twice as many liberal interest groups as conservative groups with policy change. Democratic politicians also played more frequent roles. The most active Republicans, such as President Richard Nixon and Sens. Jacob K. Javits and Bob Dole, supported mostly liberal and mixed policy changes, rather than conservative changes. Republican involvement in policy has meant compromising with liberals to expand government or trading contraction in one place for expansion in another." Here's Grossman's bottom line: "The arc of the policy universe is long, but it bends toward liberalism. Conservatives can slow the growth of government but an enduring shift in policy direction would be unprecedented. History shows that a do-nothing Congress is a conservative’s best-case scenario." Is it any wonder that so much of the GOP establishment, not to mention Democrats, devote so much of their energy and resources to marginalizing the Tea Party? Background. Your humble scribe, ElGrowlerGrande, first became interested in the issue of taxation and interstate migration after reading a paper by Ohio University economics professor Richard Vedder. This discussed this in an article in the July 28, 2003 edition of The ACTA Watchdog. We focused on the question of how decisions of the Arlington County Board affect peoples' decisions to move or stay. Tables 1, 2, and 3 in that 2003 edition of The ACTA Watchdog, which used IRS county-to-county migration data, provided an array of information for tax years 2001-2002, and suggested a correlation between Arlington's high taxes and peoples' decision to move elsewhere. Consequently, a series of posts the past week by Lyman Stone at the Tax Foundation's Tax Policy blog caught our eye. Stone used a 5-part blog posts to respond to a "voluminous" report, entitled "State Taxes Have a Negligible Impact on Americans' Interstate Moves," by Michael Mazerov of the very liberal Center on Budget and Policy Priorities (updated May 9, 2012). "The Center on Budget and Policy Priorities’ Michael Mazerov has a voluminous new report discussing how state tax policies relate to migration. It’s an interesting debate to be had, both because migration is a major economic issue for many states, and because the two extremes of the debate tend to be so vocal. Advocates on one side appear to argue that small changes in taxes create huge changes in migration while advocates on the other seem to suggest that people don’t respond to taxes at all. CBPP’s new report says that “State taxes have a negligible impact on Americans’ interstate moves,” and so falls pretty comfortably in the “taxes don’t affect migration” camp. High-tax states actually don’t have that much more net out-migration than low"
Stone admits to there being "a grain of truth to CBPP's position. People move for many reasons, and taxes are only one of many influential factors." The five parts in the series are too long to condense into even a medium-length Growls. Links to all five parts can be found here in part 5. "Unfortunately, he doesn’t provide the data for states with net inward migration. He also doesn’t provide information on how much income migrates; and in fact doesn’t even show the actual population changes, just the number of “households,” which may vary in size. These omissions are particularly odd as, in the paragraph right above the incomplete chart, he says it’s important to look at “all of the available migration data” (emphasis Mazerov’s). This could lead to readers getting the wrong idea that differences among state migration patterns are small. In fact, that is exactly what Mazerov does claim, when he says “As it turns out, net migration in most states is indeed quite small compared with total or gross migration” (emphasis Mazerov’s)." New York: 68.3% of departing households are replaced by new arrivals; 60.5% of departing population are replaced by new arrivals; and 59.9% of the departing income is replaced by arriving income. Virginia: 106.4% of departing households are replaced by new arrivals; 105.6% of departing population are replaced by new arrivals; and 101.6% of the departing income is replaced by arriving income. 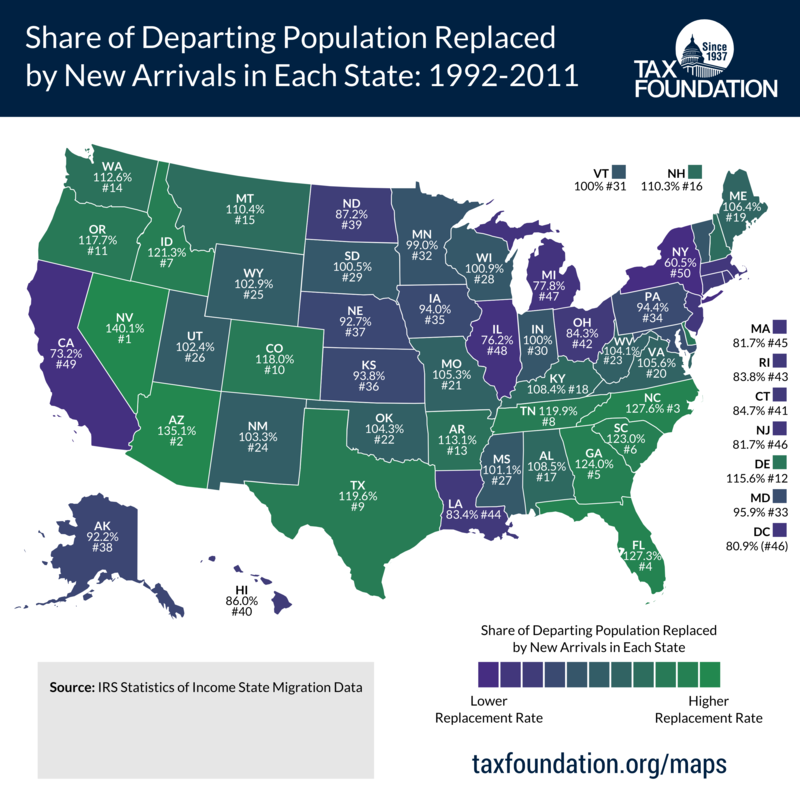 "On the whole, these high-inward migration states tend to have lower tax burdens. North Carolina and Idaho have periodically had higher than average tax burdens, but most, like Tennessee and Nevada, have consistently low tax burdens. Again, this doesn’t conclusively prove that taxes drive migration, as no doubt other living costs are lower in these states too: but it does suggest that taxes cannot be discounted out of hand. Kudos to Lyman Stone and the Tax Foundation for helping American taxpayers to understand how and why taxes matter. I will make an effort to update the 2003 migration study of Arlington County in the next several months. The Arlington County Board was hitting on all eight vanity cylinders at their recessed meeting Tuesday evening, May 13, 2014. Yesterday, we growled about the Aquatisphere -- aka Acquatics Center -- and the need to sell park bonds even though there already was park bond money in the proverbial till. Even before approving the sale of $74.5 million in general obligation bonds, the County Board warmed up by acquiring 1101 Lee Highway, a small Rosslyn lot measuring 26,555 square feet (search the real estate data base for RPC 16-018-009). The agreement of sale was item #19 on the County Board's so-called consent agenda. Be forewarned, however. If if you're driving on Lee Highway, and try to find the property's frontage on Lee Highway, you're out of luck, according to Michael Neibauer, staff reporter for the Washington Business Journal. "How much is it worth to Arlington to prevent less than two-thirds of an acre of vacant land from being developed? When that property is located immediately south of the Key Bridge: millions. "The Arlington board on Tuesday unanimously agreed to pay The Holladay Corp., a D.C.-based developer, nearly $2.4 million for 1101 Lee Highway, a wooded parcel bounded by the George Washington Memorial Parkway to the north and east, the Key Bridge to the north, North Lynn Street to the west and the Mt. Vernon Trail and an Interstate 66 off ramp to the south. The site has no frontage on Lee Highway. "The site was previously home to a substation and an office building until the mid-1960s, when the property was cleared of all development. And that's how Arlington wants to keep it, at least for now. The goal is to provide park space in the near term, protect views from Rosslyn to the river, and possibly use the site in the future for an "ancillary boathouse" or a realigned Mt. Vernon Trail, or both." The county poohbahs produced a press release to emphasize the following three "bullets:"
"County Board members on May 13 agreed to pay $2.4 million for the Rosslyn parcel, which is expected to be used for open space or recreational use, possibly to complement a long-awaited new Potomac River boathouse. "County Board Chairman Jay Fisette said the opportunity to acquire the parcel was too good to pass up. “We have a willing seller and a willing buyer – it’s time to move forward,” Fisette said at the meeting." Remember the $3,6 million that Mr. Kubicki asked the County Board about in our Growls yesterday? Without the purchase of the 1101 Lee Highway parcel, the total amount of the general obligation bonds could possibly have been reduced except that the Manager used Parks land acquisition bonds funds to purchase the 1101 Lee Highway parcel as noted in the "fiscal impact" section of the Manager's report to the Board for agenda item 19 (see page 3). Another question for the Board and Manager: why was this parcel assessed by the county for $619,600 for the years 2014, 2013, 2012, 2011, and 2010, and not closer to the $1.98 million determined by an independent appraisal? Oops! Oh yes, those were the years when the Manager eliminated two internal auditors for budget reasons. As a result, there was no one to even assess the reason. You just can't have too many fiscal watchdogs to look out for the interests of Arlington County taxpayers when the Arlington County Board is in session. Item 28 at the Arlington County Board's recessed meeting on Tuesday evening, May 13, 2014 involved the sale of up to $74.5 million of 2014 general obligation bonds. This includes $7.4 million for the streets and highway bond fund, $3.6 million for the parks and recreation bond fund, and $36 million for the schools bond fund. The item had been removed from the Board's Saturday, May 10, 2014 "consent" agenda. "The Long Bridge Park aquatics center is on hold, but it is still costing taxpayers cash, Arlington officials acknowledge. "Last spring, the county government sold $15 million in parks-and-recreation bonds, most of them to pay for the planned aquatics center. Ever since the sale, when the cash was banked, the county government has been paying interest (in the range of 3.5 to 4 percent) on the bonds while earning much less (in the realm of 0.5 percent) on the money it borrowed. "The issue came up at the May 13 County Board meeting, when fiscal watchdog Wayne Kubicki asked why the county government planned to sell an additional $3.6 million in parks bonds – this time for maintenance of facilities – when it could simply use the funds it has had on hand since last year. "The response from County Manager Barbara Donnellan: If she can find a way to get the aquatics center back on track, those funds currently in limbo will be needed to help pay for construction, so they can’t be spent elsewhere." "Pressed by County Board member John Vihstadt on how much the county is losing by having the money sitting around, Cowan acknowledged there was a cost involved, but said staff hadn’t quantified the amount. "After that back-and-forth, County Board members voted 5-0 on May 13 to approve the sale of nearly $75 million in new bonds, including $3.6 million for park-maintenance projects. Vihstadt only went along after receiving assurances that none of the $74.5 million in bonds had anything to do with streetcars, the aquatics center or Columbia Pike SuperStops, all of which currently are in political crosshairs in a debate over county spending priorities." I'm sure the fact there is a cost to taxpayers whenever Board vanity projects sit in limbo because they are not well-thought out came as news to at least one or two Board members. Readers are also urged to read Mr. McCaffrey's full report. In addition, readers are urged to read the Manager's report to the Board for agenda item 28. Of special interest is the chart on page 3, which shows that in 2008, 2010, and 2012, voters authorized a total of $484.7 million in bond referenda. Of that, $354.9 million has been issued, and $55.2 million would remain unissued. Kudos to Mr. Kubicki for asking the Board why the county "planned to sell an additional $3.6 million in parks bonds . . . when it could simply use the funds it has had on hand since last year." Now we know the Manager is still working to get the Board's vanity project at Long Bridge Park built. "In contrast, NTU argued repeatedly that these concerns were overblown and that the bloated federal government could find plenty of ways to absorb the sequester’s modest trims." Stephanie McNeal of Fox News even reported on Thursday that "Senate Majority Leader Harry Reid upped the doomsday rhetoric in July, according to the Washington Post, saying on the Senate floor over a million jobs were already lost. "The U.S. Government Accountability Office (GAO) has just released a study that sheds light on the actual impact of sequestration, which cut 2013 expenditures by $85 billion. "The total number of federal job losses that occurred: one." "Remember last year when everyone was talking about "devastating" cuts to the federal budget due to "sequestration"? "As then White House flack and now-CNN Crossfire host Stephanie Cutter defined sequestration last spring, it amounted to a "series of automatic and destructive budgets cuts that you and your neighbors are just beginning to feel." "The horror, the horror: White House tours canceled, military bands not playing, little kids starving, planes dropping from skies (not that they would have had passengers, what with the TSA lines getting infinite due to budget cuts...). "Yeah, no. Not only were those cuts removed through a bipartisan budget deal passed early in 2014, they were hardly draconian to begin with. The cuts slated for last year totaled $44 billion in a $3.5 trillion budget, plus a slightly lower amount for this year and going forward. “Today, I’m sending a letter to the Office of Management and Budget with the hope of soliciting a fact-based explanation for the American people. The American people deserve to know the truth, especially if it suggests politicians’ favorite programs can endure far more in budget cuts than sequestration imposed,” Dr. Coburn added. Gillespie also links to Sen. Coburn's letter and to an "interview with him about 'how both parties bankrupted America.'" No surprisingly, most of the reporting, according to a Google search, came from conservative sources, e.g, the Washington Times, Townhall.com. Hot Air, NewsMax, and American Thinker. An explanation of why Rush Limbaugh uses the phrase low-information voters to describe those who vote for liberal/progressive politicians? Now that the Arlington County Board has adopted the FY 2015 budget, the county's management's thoughts turn to the capital improvement plan (CIP). In two lengthy news reports this week, the Arlington Sun Gazette's Scott McCaffrey first reported the "Arlington school system's capital plan faces reality of debt ceiling" on Monday, May 12. Then today, he reported the "Arlington county manager seeks $2.7 billion for 10-year capital plan." "School officials are constrained by the County Board to spending no more than 10 percent of their annual budget on principal and interest payments for debt; any more and the county’s sacrosanct AAA bond ratings could be jeopardized. "A building spree over the past 15 years has at times pushed the school system perilously close to that limit, although the school district in a sense has gotten lucky: an environment of low interest rates has allowed school officials to build more and accrue debt without being handcuffed by massive annual bills to repay it." "But with Arlington Public Schools already spending more per student than any school district in the local area, and with the county government currently under siege from the public over its perceived gold-plated spending, more cash for schools is an unlikely scenario. "For the most part, Arlington has managed to avoid the political blood-sport between elected officials (city council and board of supervisors members) and elected School Board members that has developed in jurisdictions across Northern Virginia. But with Arlington’s student population expected to rise from the current 23,000 to an estimated 30,000 or more, and with a current per-student cost of about $19,000 (40 percent higher than in neighboring Fairfax County), something is going to have to give. “It’s not going to work with the revenue we’re getting now,” School Board Chairman Abby Raphael said near the end of a long night of discussion. "But Raphael and her board colleagues don’t have the final say, since Virginia law prohibits School Boards from having independent taxing authority. Arlington’s school system relies on the County Board for about 80 percent of its funding, and County Board members are contending with an electorate that is increasingly aggressive in its criticism of the county’s spending policies and tax burden." "Assuming the economic rebound continues and interest rates don’t rise through the roof, Arlington should be able to shoulder the $2.7 billion 10-year capital-improvement program proposed by County Manager Barbara Donnellan without imperiling the county government’s coveted AAA bond ratings. "Donnellan unveiled her proposed package of big-ticket items, with its decade-long time frame that surely will outlast both her tenure and that of most or all County Board members, on May 13. Board members will finesse the plan and adopt their own version in late July, the same day they will ask for court permission to put funding for a host of capital projects on Nov. 4 ballot referendums. "Her package represents “prudent and responsible investments,” Donnellan told County Board members." Also of note, McCaffrey adds, "A little over half the entire amount is planned to address transportation, ranging from road-paving to the Columbia Pike and Crystal City streetcar projects." He also includes the "highlights" from the 2015-2024 CIP, with projects such as $318 million for water/sewer infrastructure maintenance, $514 million for the Columbia Pike and Crystal City streetcar projects, $128 million for street paving, and $28 million to rebuild the Lubber Run Community Center. Yesterday, ARLnow provided a detailed write-up on the county's CIP, and included a link to the County Manaager's 2015-2024 Capital Improvement plan. We'll growl more about the two CIPs after digging into the two plans. We growled last week -- May 7, 2014 -- after the Washington Post's Patricia Sullivan reported that Arlington County's senior management had decided there should be no more $1 million bus stops. Rather, the bus stop program's cost would be reduced by 40%, and each of the the remaining 23 vanity bus stops would now cost between $362.000 and $579,000 each. However, the natives apparently aren't buying what the county poohbahs are selling. An online poll at ARLnow.com has recorded 1,465 votes as of a few minutes ago, and 78.77% (1,154 votes) still consider the bus stops too expensive. "And as of January, the county had already spent $2.3 million on the project, with just one shelter to show for it. "The county paid consulting firm Parsons Transportation Group $250,000 to redesign the stops and fix some issues with the one prototype “Super Stop,” which many riders said didn’t protect them from the weather. Those two figures are nothing less than jaw-dropping. It's difficult to even wrap my brain around either one. “A lot of people, when they hear about the cost and they look at it, they say, well I don’t understand where all the money went,” Balliet said. "For starters, the price tag is high because the platform is 90-feet long and made to fit two buses. The canopy is curbed to make for easier loading and unloading, Balliet said. "The prototype stop also was built with a heated concrete floor and a screen to tell riders when the next bus is scheduled to arrive. "Balliet said the costs are “in line” with other transit systems that serve light rail. County staff pointed to a light rail stop in Hampton Roads that has columns and cost $762,000. "Of course, other no-frills bus stops in Arlington cost just $30,000. "Balliet, however, said the extra cost is worth it to accomplish the county’s two primary goals — accommodating lots of riders and convincing people to travel either on foot or by public transportation. “We have more than 16,000 transit riders daily,” Balliet said. “And that’s one of the highest bus ridership corridors in the state of Virginia. At this point, the price tags are nothing more than estimates. The project won’t be put up for bid until later this year. “We need to focus spending on core services first — public schools, public safety, infrastructure maintenance and neighborhood quality of life — not a $310 million streetcar (and) million-dollar bus stops,” John Vihstadt, who ran as an independent, said during his campaign." "County transportation director Dennis Leach said the goal for the nearly two dozen proposed shelters remains the same: to provide “weather protection, comfortable waiting environments and real-time information” to riders, whether they are waiting for buses or, if it gets built, the proposed Columbia Pike streetcar system. "The new design lowers the angle of the canopy to a 1.5-degree slant (down from 10 degrees), lowers the roof by 3 feet and extends a larger cover to allow more people to be protected from the elements. "After the cost of the prototype station – located on Columbia Pike near South George Mason Drive – won local, national and even international derision in the spring of 2013, County Manager Barbara Donnellan called a time-out. County officials worked with Parsons Transportation Group to come up with a cheaper and, they say, ultimately better design. “There were technical issues that we were able to identify that have been addressed, and those were among the lessons learned. And certainly, lowering the canopy, lowering the angle of the canopy and simplifying the design will help continue to reduce costs,” said Stephen Del Giudice, Arlington transit bureau chief of the county government’s Department of Environmental Services." As to who's paying for this fiasco? According to Konheim, "Slightly more than half the $12.4 million cost will be picked up by the federal government through various grant programs, with 14 percent coming from state funds, 28 percent from the county government’s transportation fund and about 6 percent coming from the county’s general fund." Imagine, too, that the County Board was willing to spend $250,000 to redesign their vanity project, but they had to wait for "one-time funds" to become available before they could begin reconstructing an internal audit staff, which the Board allowed to wither on the vine (see link to Civic Federation report available at our May 10, 2014 Growls). "Professor Friedman highlights that people spending someone else’s money on others is a “distributor of welfare funds.” Strong words with a certain amount of truth wouldn’t you agree?" Sounds as if it's time for Mr. Vihstadt to lead his four Board colleagues in repeating a portion of his quote above at the start of each Board meeting, i.e., "We need to focus spending on core services first." And only then should Board meetings be allowed to proceed. A $400,000 Fedrull Gummint "Training Meeting"
At the Washington Free Beacon news site today, Elizabeth Harrington reports that a Consumer Finance Protection Bureau (CFPB) "training session" is estimated to cost almost $400,000. According to Harrington, "The five-day meeting will cost up to $389,940 for rooms and food alone." "The Consumer Financial Protection Bureau (CFPB) is planning an “all hands” meeting for its more than 1,300 employees at a hotel in Washington, D.C., this summer, with cost estimates nearing $400,000. "The agency will book up to 475 hotel rooms each night for a five-day conference in July. The CFPB issued a solicitation on Friday, which included an attachment with the agency’s request for hotel accommodations. "The event is billed as a “training meeting,” which will be run by its Supervision Enforcement and Fair Lending division. The division is responsible for ensuring large banks are complying with the more than 400 regulations found within the 2,300-page Dodd-Frank law. "The meeting is tentatively planned for July 20-25, with employees staying at the hotel Sunday through Friday. The CFPB expects to need 150 rooms Sunday evening; 475 rooms Monday through Wednesday; and 400 rooms on Thursday, for a total of 1,975 nights." "The CFPB will also spend thousands on refreshments for its employees during the weeklong conference. “Light morning refreshments” for four morning breaks will serve coffee, pastries, bagels, and fruit for up to 700 people. "The food can cost no more than $7.10 per person, meaning the agency is allotting up $16,330 for the breakfast breaks. Two afternoon breaks will also be catered, at a cost of up to $9,585 for coffee, soda, and snacks. "Lunch will cost up to $34,200, with the agency allocating a maximum $18 per person for three days. Five hundred employees will be served on Tuesday, and 700 on Wednesday and Thursday." Nothing too good for our fedrull employees, eh? Kudos to Elizabeth Harrington and the Washington Free Beacon for bringing this latest outrage about the use of federal taxes to our attention. Has MSM Abandoned the IRS Scandal? Paul Bedard, who writes the Washington Secrets column at the Washington Examiner reported last Wednesday that, according to a new Media Research Center report, "TV abandons IRS scandal; just 14 stories in 10 months as issue rages again." "Despite continued news about how the IRS targeted conservative and Tea Party groups leading up to President Obama's re-election and the possibility that former tax official Lois Lerner could be imprisoned by the House for contempt, the Big Three TV networks have dropped the scandal like it never happened. "According to a new Media Research Center report, ABC, CBS and NBC have provided just 14 reports about the scandal over the last 10 months, compared to 136 when it broke in May 2013. "What happened? According to the conservative media watchdog, when a Democratic report was issued in June 2013 suggesting that liberal groups were targeted equally by the IRS, the major media gave up coverage, even though that report was widely rejected, even by Treasury's inspector general. "Since then, the House Committee on Oversight and Government Reform voted along party lines to recommend that the full House hold Lerner in contempt. A Roll Call report even suggested that the House, after voting, could imprison her." The complete Media Research Center's report about news coverage of the IRS scandal is here. Similarly, the MRC reports the "networks spend 27 minutes on climate change, (but) just 15 seconds on Lois Lerner (central figure in the IRS scandal) contempt vote." Is there any wonder why the ratings of Fox News are so high? UPDATE (7/5/14): In an editorial at Investor's Business Daily, posted on Thursday, the newspaper took on the so-called mainstream media (MSM) of failing to effectively report on two major reports of the HHS Inspector General concerning ObamaCare. We growled about the two reports on July 1, 2014.
Who is Looking Out for Arlington County's Taxpayers? "The Arlington County government is making moves in the right direction to improve its internal-audit capabilities, members of the revenues-and-expenditures committee of the Arlington County Civic Federation say, but more remains to be done to ensure the $1 billion spent each year by the county government goes where it is supposed to. "Three members of the committee – Suzanne Sundburg, Burton Bostwick and Tim Wise – updated the federation’s membership May 6 on an issue that long has been a bone of contention between the Civic Federation and the county government. "Federation officials have pressed for an independent inspector general with power to investigate both the distribution of funds and the efficiency of government programs. Failing that, they want to see more resources put into internal auditing of government accounts, which they say is a basic tenet of sound fiscal management. “It’s the rough equivalent of you looking over your check register and your charge accounts every month,” Bostwick said. "Without an internal-audit function, “there is no systematic evaluation,” he said. “The bottom line is, we just don’t know [whether government funds are going where they should], and we haven’t known for a long time,” Bostwick said." Overview, page 1. Provides the background on how we got to this point where there is little oversight on the county’s $1.1 billion budget. Staffing levels, Table 1, page 3. A comparison between Arlington and Henrico counties, both having $1 billion budgets, of internal audit staffing. Appendix A , pages 6 and 7, provides a valuable and detailed timeline of the Internal Audit Function for the period 2010 to 2014. Appendix B, page 8, is from a report 2010 report of the Virginia Auditor of Public Accounts reviewing 37 internal audit functions among Commonwealth agencies and institutions of higher education. The table shows the 2009 actual expenditures and positions of the agencies as well as their internal audit staffing. Your humble scribe is quoted by Scott McCaffrey in the Arlington Sun Gazette article regarding potential internal audit staffing -- "about 10 people." That number was derived from a "back-of-the-napkin" calculation using the numbers from that 2010 report of the Virginia APA. Two provisos are in order. First, the number would necessarily include both the county and schools internal audit staffing, and second, a more precise staffing number would necessarily require a risk analysis. "Despite their concerns, the trio praised Michelle Cowan, the county government’s director of management and finance, for her openness to Civic Federation concerns. "Cowan acknowledged that “significant budget and staff reductions” in 2010-11 had an impact on audits, as her office lost two auditor positions. “While the internal-audit function was never fully eliminated – contractor funding and a portion of staff time remained dedicated to the effort – [County Manager Barbara Donnellan] made it a priority over the last year to increase and bolster the function,” Cowan said. "The result has been the return of one position and more funding for contract services." Read that guidance again. Sure sounds that unless Arlington County taxpayers speak loudly in the November 2014 elections, the County Board could easily decide to once again bury the internal audit function deep in the bowels of the bureaucracy for without strong and independent internal auditing, any waste, fraud and abuse of taxpayers money will not be transparent. So while the county may be moving in the right direction, those October 31, 2014 and January 2015 dates stick in our craw for another reason. On April 5, 2014, we growled that the School Board hired a director of internal audit, and said the School Board "deserved) kudos for having the wisdom to hire an experienced internal auditor." So while the School Board acts, the County Board has chosen to fiddle for another year. UPDATE (5/12/14): I updated this to make two minor grammatical erros. "Like the foundation of a home, America’s economy must be built on something real, something solid, and something firmly planted. Neither federal stimulus in the form of easy money, nor fiscal stimulus in the form of government borrowing, can produce real, lasting prosperity or a sound financial future. Millions of Americans face an economic future with great unease today. A large majority thinks the nation is on the wrong track. "The Federal Reserve is not infallible. Our responsibility as legislators is to provide oversight. We are one small voice for the people in this process. In 2011, the Fed forecasted growth of between 3.5 and 4.3 percent in 2013. Actual growth was an anemic 1.9 percent—roughly half. This is a drastic over-estimation, not a small miss. And, the Fed overestimated 2013 growth in every formal quarterly prediction for each year since 2011. For the people’s representatives your performance is not good. "Let us consider whether the stimulus policies of the last five years have produced the results predicted by the Fed. Since 2007, interest rates have been near zero and the federal government has added $8.3 trillion to the debt. But where do we stand? The population has grown by 15 million since 2007, yet there are still 500,000 fewer people working than in 2007. The workforce participation rate has fallen to 63 percent of the civilian population, which is the lowest level in 36 years. Median household income has fallen an average of $2,268 per household. The low income cohort has grown while the middle income group has shrunk. The middle class is getting smaller in America. "While the stimulus mindset in Washington has at least, so far, been better for the investor class and the political class, it has not been good for the working class. Not only has this stimulus failed American workers, but it has left us with record debt and an economy dependent on unprecedented policies that cannot continue." HT John Hinderaker, Power Line blog, May 8, 2014. Only an Idiot would pay $150 per Gallon of Jet Fuel . . . oops! "The Department of Defense (DOD) paid $150 per gallon for alternative jet fuel made from algae, more than 64 times the current market price for standard carbon-based fuels, according to a report released on Wednesday. "GAO’s report examined the financial challenges facing increased purchases and use of alternative jet fuels by federal agencies. “Currently, the price for alternative jet fuels exceeds that of conventional jet fuel,” the report noted. "The price for conventional jet fuel is currently $2.88 per gallon. GAO’s report reveals that federal agencies have paid significantly higher prices in an effort to promote biofuels in commercial and military aviation. “Of the two alternative jet-fuel production processes approved for use in commercial and military aircraft (Fischer-Tropsch and HEFA), DOD, according to a DOD official, paid from about $3 to $150 per gallon,” GAO reported." Markay cites two other instances of the Pentagon "paying exorbitant prices for aviation biofuels:"
"Reuters reported in 2012 that the Air Force had purchased 11,000 of alcohol-based jet fuel for $59 per gallon from a Colorado-based biofuel company. "That company, Gevo Inc., was backed financially by high-dollar Democratic donor Vinod Khosla, who has invested in a number of companies that have received federal support from the Obama administration. "A week before that story broke, the Navy spent $26 per gallon to fuel its Great Green Fleet during the 2012 Rim of the Pacific exercise. "The $150-per-gallon DOD reportedly paid for HEFA fuels would dwarf those previous purchases, which came under fire from critics of the Obama administration’s green energy push." “Though some energy technologies that are too expensive for general civilian use may make sense for the military, biofuels are not among them,” wrote Heritage Foundation senior energy policy analyst David Kreutzer in 2012. Kudos to Lachlan Markey for bringing us this informative story. Under a heading of "No more 'million dollar bus stops'' in Arlington," the Washington Post's Patricia Sullivan writes, "The 23 successors to Columbia Pike’s “$1 million bus stop” will cost 40 percent less when they are built, Arlington County officials said Tuesday, after a year-long review and redesign of the bus-and-streetcar shelters." We've growled on numerous occasions about the so-called $1 million "SuperStop" at Columbia Pike and Walter Reed Drive, most recently on December 17, 2013 when we noted the prodigious example of county waste was ranked #18 in Senator Tom Coburn's 2013 Wastebook. However, we also also growled about it here, here, and here. "County Manager Barbara Donnellan said that lowering and changing the angle of the canopy, simplifying the design and using standardized parts will drop the cost of the remaining stops from $20.9 million to $12.4 million. Donnellan, speaking at a news conference at Arlington Mill Community Center where county employees outnumbered reporters, said the county will take over construction management of the glass-and-steel transit stops, formerly known as “superstops,” from the Washington Metropolitan Area Transit Authority. "The prices announced Tuesday are county estimates; prices could change when the project is put out to bid later this year. "The unveiling of the first superstop in 2013 resulted in an outcry from residents, visitors and passersby, who noted that despite the time and money it took to build, the shelter did not keep rain and snow off waiting passengers. The steel seats were freezing in winter and superheated in summer. The roof also leaked. "After local, national and international news media did articles and broadcasts from the scene, Donnellan ordered a halt to the remaining stops. "The freshly-redesigned stops — which were designed by the county and a consultant — will feature six covered, concrete seats, as opposed to the Super Stop’s steel seats. The canopies, which on the Super Stop did little to keep out the elements, will be lowered in height from 13 feet to 10 feet and the angle reduced from 10 degrees to 1.5 degrees. The total canopy coverage will also increase from 243 to 295 square feet on standard transit centers. In addition, side windscreens will be added to enhance weather protection. "The new stops, which the county is rebranding from “Super Stops” to “transit centers,” have a modular design, meaning each is built with standardized parts that can be added on to in order to create larger stations, as needed. A “single-size” station will cost $362,000, a “standard” transit center will cost $469,000, and an “extended” transit center — planned for the north side of the Pike at S. Glebe Road, for example — will cost about $672,000. Perhaps thinking one press release was not enough, about two hours later, the county released a second press release containing the statement of the Arlington County Board Chairman. Now we know he is "very pleased with the work that the Manager and staff have done to not only improve the functionality of the Columbia Pike Transit Stations, but also to substantially reduce construction costs." In growling about the results of last month's special election, we asked whether it represented a "new era of fiscal sanity." If yesterday's announcement that the cost of the "SuperStop" program has been reduced by all of 40%, the answer seems to be that four of the five Board members have yet to get the message. On August 29, 2013, we growled about a story at ARLnow.com, which reported on a bus shelter "recently installed on Columbia Pike at 1.25% of the cost of the $1 million 'Super Stop.'" We can't wait to hear why it's necessary to spend almost 40 times more than the recently installed bus shelter. If this is "best value for every dollar spent," as the Board chairman notes in his statement, most taxpayers will conclude their definition of "best value" is not nearly as expansive as the Board chairman's definition. Could this be a "new math" being taught by the Arlington Public Schools? Just wondering! And kudos to Ms. Sullivan and Mr. Rothstein for their reporting. Be sure to read their complete reporting. Source: His January 14, 2014 column, "The Idol of Equality: To put equality ahead of liberty is to war against human nature," posted at National Review Online. "The number one threat to our republic is not the debt, is not the entitlements, is not invasion from another country. The number one threat to our country is lust. It is not a sexual lust. It is a lust for power. Since time began, the lust for power and its ruthlessness has ruined liberty, derailed democracy, wrecked republicanism, crippled nations and killed millions. The paths have been many but the goal singular — lust, lust for power." Source: Her May 4, 2014 column, "Legislators Are Digging Their Own Grave, Taking Us Down with Them," posted at Pajamas Media. "If you’re a regular reader, you already know I’m a big supporter of tax competition and tax havens. "Here’s the premise: Politicians almost always are focused on their next election and this encourages them to pursue policies that are designed to maximize votes and power within that short time horizon. Unfortunately, this often results in very short-sighted and misguided fiscal policies that burden the economy, such as class-warfare tax policy and counterproductive government spending. "So we need some sort of countervailing force that will make such policies less attractive to the political class. We don’t have anything that inhibits wasteful spending,* but we do have something that discourages politicians from class-warfare tax policy. Tax competition and tax havens give taxpayers some ability to escape extortionate tax policies." Mitchell then uses several quotations from a NY Times article to discuss why Pfizer, which "is seeking to redomicile in the United Kingdom" primarily to significantly reduce it's tax burden. is moving. The bottom line, based on a quotation in a Wall Street Journal article provides the reason for Pfizer's move, ". . . because the combined state-federal corporate income tax rate in the U.S. is nearly 40%, compared to the 21% rate in the U.K."
We growled about America's tax uncompetitiveness almost two years ago on September 22, 2012. "The bottom line is that greedy California politicians are trying to seize too much money and are driving away the geese that lay the golden eggs." "The real puzzle is why most high-tax governments don’t learn the right lessons. Are the politicians really so short-sighted that they’ll drive away their most productive people? "But notice I wrote most, not all. Because we do have some very recent examples of very left-wing states doing the right thing because of tax competition." He then discusses several states that are making changes to their estate taxes. He then concludes by noting, "Tax competition isn’t a sufficient condition for good policy, but it sure is a necessary condition!" For Americans who have submitted their federal tax returns to the IRS, our friends at the National Taxpayers Union released their annual study of the price Americans pay to comply with the federal tax code on April 15, 2014. (Press release here, and NTU Policy Paper #134 here). “Our convoluted tax laws cost much more than the dollars collected. It's time Congress and the President put a stop to the over $200 billion in wasted time and money spent figuring out our complicated tax laws." That is the equivalent of about 3.05 million employees working 40-hour weeks year-round with just two weeks off; or more than the number of workers at three of the biggest retailers in the Fortune 500 - Walmart Stores, McDonald's, and Target - combined. It is also four times more than the number of workers at the top four banks: Bank of America Corp., Wells Fargo, Citigroup, and J.P. Morgan Chase & Co. The total compliance cost is $224.3 billion a year. For individuals alone it is $90.3 billion. Individuals spend a combined $31.7 billion a year on tax software and other out-of-pocket costs. When calculated at the average hourly wage, the value of the labor involved in tax compliance is a jaw-dropping $192.6 billion. The most recent Information Collection Budget published by OMB attributes 6.7 billion hours of paperwork burdens to the U.S. Treasury, most of it due to taxes. The Treasury accounted for 74 percent of the government-wide paperwork compliance burden all on its own; no other agency had a share above 6 percent. The average taxpayer using the 1040 “long” form – which according to IRS projections amounts to two-thirds of all 1040 returns filed – spends 15 hours on tax compliance. That’s long enough to watch the entire Dark Knight Trilogy, Christopher Nolan’s three Batman movies – twice. Out of pocket costs for individual taxpayers are expected to average $280. About 151 tall Starbucks coffees. Paid preparers and tax preparation software accounts for over 90 percent of returns – a telltale sign of tax complexity problems. First, a table on page 8, shows the percentage of tax returns prepared by paid preparers. In 1980, 38.0% of all federal tax returns were signed by a paid preparer. The percentage increased to 44.7% in 2011. The second data point is a chart on page 9 that shows the average fee charged by H&R Block. In nominal dollars, the average fee for calendar year 1980 was $27.36. For calendar year 2013 returns, the nominal amount increased to $198. Adjusted for inflation (using the DoL CPI Calculator), the average fee for those 1980 tax returns would be $78.46. Thus, the difference of almost $120.00 between $198.00 can be considered the added price added by our political landlords in Congress and the White House. As the NTU policy paper puts it, "The efficiency gain of computers and printers has been overwhelmed by the increases in complexity." "A survey from the National Society of Accountants pegged the average fee for a 1040 itemized tax return with Schedule A (plus a state return) filed this year at $261, an increase of 6.1 percent versus the previous year. But woe to the small business owner, who would have to pay extra for forms like the 1040 Schedule C ($218) or the Form 1120S for a Subchapter S Corporation ($761). These amounts represent similar jumps over returns filed in 2013 (6.3 percent and 6.1 percent, respectively)." Kudos to NTU and to David Keating. And tell members of Congress that ACTA sent you! Will A Third Arlington County Board Member Listen? "Patrick A. Hope, a Virginia state delegate who is seeking the Democratic nomination in the 8th Congressional District race, and Alan Howze, the County Board hopeful, said residents should have a say in whether the 4.5-mile, $310 million streetcar line should be built. Both candidates support the project. "Howze and Hope said they continue to support the proposed streetcar line as the best option for Columbia Pike redevelopment and for retention of affordable housing. But they said the public should be allowed to weigh in. “As we have done with Metro, schools, the Water Pollution Control Plant and other important community investments, we should give voters the final decision,” said Howze, whose support of the streetcar during the recent County Board special election seemed to have hurt him with the electorate and contributed to the worst election defeat for a Democratic County Board candidate in three decades. "In the May 1 statement, Howze suggested he got the message. “I heard the concerns expressed by voters in the recent special election, and we can put the streetcar debate to rest and ensure public confidence by allowing a referendum vote,” he said in a statement." "Arlington County in the past has said that a referendum could not be legally held since it’s not planning on funding the streetcar via bonds. Hope and Howze, however, point out that an advisory or binding referendum could be held if approved by the Virginia General Assembly." Importantly, ARLnow.com's reporting also includes the statements of Howze and Park as well as the statement of Board member John Vihstadt. As ARLnow points out, John Vihstadt's "election (at the April 8, 2014 special election) was considered by some to itself be a referendum on the streetcar, is pushing for the county to halt all spending on the streetcar." All three news reports are too lengthy to include here. Growls readers are urged to read each of them to ensure a complete understanding of the issues raised. However, we congratulate Patrick Hope and Alan Howze for supporting a voter referendum. We have always felt that when voters are presented the facts in a clear and logical format, they almost always speak clearly and loudly to their elected representatives. Consequently, we are happy that Howze and Park now agree with Arlington County Board member John Vihstadt. Will one of the other three Board members (joining John Vihstadt and Libby Garvey) listen to the two candidates and to the voters of Arlington County? "Liberals don't talk -- or perhaps even think -- in terms of the actual consequences of their policies, when it is so much more pleasant to think in terms of wonderful goals and lofty rhetoric." Source: His April 24, 2014 column, "The High Cost of Liberalism, Part III," posted at Townhall.com.